A career advisor explains why many talented, hard-working people often miss out on their full career potential, revealing the tells, blind spots, secrets, and unspoken rules you need to know in order to play the game to win. While many careers have been impacted by economic downturns, failed projects, downsizing and restructuring, or just bad bosses or bad timing, we all know of colleagues who continue to rise through every tough situation. Most assume that they have an advantage that protects them—degrees from the right schools, great mentors, influential friends and family, or just better luck. But these hyper-successful professionals have faced setbacks, too. Instead of allowing challenges to derail their rise, they’ve learned how to manage them better. 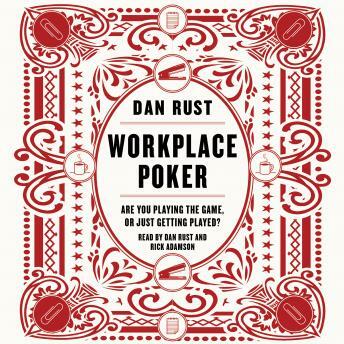 In Workplace Poker, Dan Rust gives you the strategies you need to accelerate your career, and prevent setbacks from stalling your progress or spiraling it downward. The trick, he reveals, is to “play the game under the game,” to think more deeply and act more strategically. If you are talented, ambitious, and hardworking, but feel your career just isn’t accelerating as rapidly as it should, or as fast as you would like it to, this book is for you. If you have been frustrated to see others (less talented, who don’t work as hard as you do) achieve rapid professional progress while your career stalls out, this book is for you. If you’ve been annoyed by those who are successful primarily because of where they went to school, or family connections, or financial resources, this book is for you. In his smart, funny, relatable voice, Rust shares stories of individuals who have applied these capabilities in real world situations, and provides short, focused exercises to help you think about yourself and your own career. With Workplace Poker¸ you’ll learn how to get out of you own way, and find the success you deserve.